Choose from the ghd hair straightener range to complete your kit of styling essentials. From waves and curls, to flicks and poker-straight hair, create a look that's stylish, effortless and professional with our ghd straighteners. The range of ghd hair straighteners will help you to create a multitude of hairstyles, producing shape and movement in each styling session. 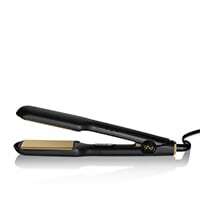 Discover the new ghd gold® styler with dual-zone technology - perfect for smoother, sleeker and healthier hair. 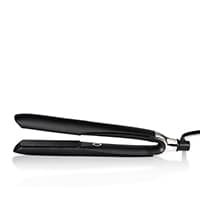 With beautiful glimmering plates, this new addition to the ghd family will work on any hair type. The ghd platinum+ styler gives you the perfect finish using ultra-zone with predictive technology that maintains a safer-for-hair heat from root to tip, reducing hair breakage* and increasing shine by 20%**. So now your hair can be stylish and healthy – all in one stroke. 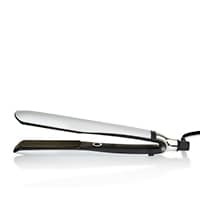 Alternatively, select the ghd max styler, which is the perfect straightener for long hair. With its cooler, lighter body and smoother plates it will glide through your hair to give you a salon finish every time. I've always wanted a GHD since they first come out. I was finally able to get my own this year with the bonus I received from my work. I love it!! I bought the original straightener. I have very fine hair so I didnt need one of the other ones with the extra heating and what not. I've used it on a couple of my friends hair and also my daughters hair. I always get complements when I've used it saying my hair looks nice and shiney. I love it and would buy it over and over again. After years of using mediocre hair tools, I finally decided to splurge for the ghd gold straightener and it’s the best decision I’ve made for my hair! It works amazing while staying at a steady temperature that doesn’t damage my hair. It also heats up super fast. Can’t recommend this product enough! Another amazing product from GHD. I do have one thing to say about it though, my hair did catch a few times when I used these the first time. I don't enjoy having my hair pulled out but hoping this won't continue to happen. This is the only reason that I have marked it down one star. The straighteners warm up quickly and glided through my hair. It was not a case of having to straighten the same area a few times, it was smooth despite the catching my hair on the side. I have curly crazy hair ... read more and I'm happy to say it stayed straight again all day despite a bit of rain! I only ever buy GHD as I have curly Spanish hair that requires the best to keep it straight all day. After going to the hair dressers they could not believe that my hair was not naturally straight. So grateful for my straighteners and how long they last. This person received an incentive to write a review. I’ve used GHDs for years but decided to upgrade to the platinum + straighteners to see if this could cut down the length of time to straighten my hair post wash. My hair is naturally curly, frizzy and thick in texture. I couldn’t believe how quickly it now takes me to straighten my hair, from 30 minutes down to 15! My hair stays straight for days, which is a life changer! Definitely recommend! I have very thick, frizzy, almost Afro like hair and these worked amazing, a wider plate means I can do bigger sections so it helps me finish my hair quicker rather than my usual 1.5-2 hours. Leaves my hair very straight and smooth. I used them on my mums hair which is a lot shorter and I’ve never seen her hair so straight. Definitely recommend this product. I love my ghd, it’s amazing! Great product, great design. Absolutely fantastic for my long, thick and wavy hair. Has made a huge difference to my hair. Love them. Maybe one thing which would make them even better is a longer cable. Definitely recommend these ghd straightners. I have fine hair but a lot of it! 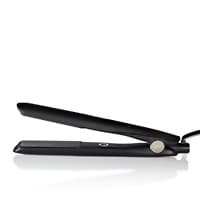 Although you can’t change the temperature for this flat iron, it straightens my hair perfectly and leaves it soft and shiny every time! I love that the plates don’t crush my hair and that it also curls my hair effortlessly. This is a beautiful styler and can’t recommend it more! 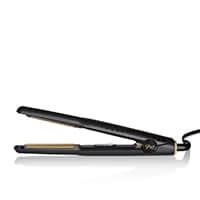 Recently had my hair cut short but have very thick wavy hair, the slim straightener is perfect for getting close to the root without burning. This product is excellent and very well adapted for short hair! My only concern is that it is virtually impossible to obtain a pouch for it. This makes it awkward for traveling. It must obviously be the standard pouch with heat resistant interior.